A number of limits were caught last week with the boat anglers catching the majority. 4,000 more fish were stocked last week, bringing the total stocked so far this season to 60,000. The main basin saw good numbers of fish caught, mainly around the aerators. Although a lot of fish taken around the aerators are stock fish, some are over wintered fish. Andy Clarke from Pickering, Yorkshire, returned to the lodge early afternoon with eight Rainbows weighing 22lb 12oz and the best of these was a 4lb 13½oz beauty. Good sized fish were caught down the arms again. Peter Blythe fished with his regular boat partner Tony Nattrass down the South Arm, catching some good fish, including a Brown estimated between 5½lb-6lb which was safely returned to the water. Robbie Winram also returned a Brown of similar size last Friday whilst drifting off the end of the peninsula. Keith Jones of Peterborough fished with Cameron Neil and the pair caught quality fish from Manton Bay with Rainbows to around 4½lb with Keith also returning three Browns all around the 4lb mark. Toff Crowther of Oakham boat fished the top of the North Arm, catching 8 fish and returning to the lodge with a brace of Rainbows for around 7½-8lb. Bank anglers have not been out in great numbers. There are still plenty of fish around the shoreline; Tim Appletons, Armley Wood, through to Barnhill Creek, along with the Normanton Bank to Fantasy Island and Whitwell frontage to Stockie Bay. The amount of food in the reservoir this season is amazing with snails, corixa, fry, sticklebacks and shrimp showing in stomach contents. There have been good hatches of small buzzer in late evening, but so far little evidence of fish feeding on them. 13 Anglers fished last Tuesday, recording 65 fish, including many of the recently stocked fish. Top rod on the night was Ady Naylor with 11lb 9¼oz. Ziggy Lesiakowski was second with 11lb 7½oz and Gary Cooper took third place weighing in at 11lb 6oz. Rob Teasdale won the free mid week boat prize with the best fish of the night weighing 3lb 9¾oz. Prospects are very good. The fresh winds throughout the weekend have broken down the loose weed around the shoreline giving bank anglers a better opportunity in areas such as the Normanton bank. There are plenty of weed beds around the edges for boat anglers to explore. Dries, nymphs and fry patterns are proving the most effective. Best Rainbow 4lb 13½oz taken by Andy Clarke of Pickering. Best Brown Two at 5½-6lb safely returned. Best boat areas Main basin (aerators), bottom of both arms. Best bank areas Normanton, Sykes Lane, Armley Wood to Barnhill Creek. Best methods Bank – Dries, nymphs, fry patterns. Boat – As for bank but include various lures, blobs, boobies and snakes over the deeper water. Mid week boat winner Paul Johnson of Sleaford. Beginners courses 13,25 & 28 August; 11,17 & 25 September and other dates throughout the season. Fly fishing for Pike from 16 May (subject to boat availability). 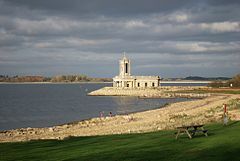 Grafham’s rod average is 3.83 with plenty of fish showing closer to the banks. The weather is a little unsettled making fishing more challenging than expected but very rewarding with the right tactics. One angler who really stood out from the crowd this week was Tom Adamson who caught 8 fish, released 7 and landed a lovely 4lb 12oz Rainbow. 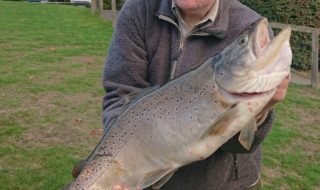 Popular areas on the boats this week are Sludge Point and Gaynes Cove, although the Dam, the Middle (drifting), the Seat, West Bank and the boils and bubbles are producing fish. Methods fishing well include tubes on intermediate lines, di7 and di8’s (counted down deep), diawl bachs, lures and floating lines (washing line style) with buzzers or diawl bachs (fishing long leaders). Dry flies are particularly popular over the weedy areas and are a must have from 6pm onwards. These, fished on top of, or just outside the weed, seem to produce more fish than many other methods. The Dam is again our most popular bank spot. Anglers can get a line into relatively deep water on a short cast to produce those fish feeding on the Dam wall. Shrimp patterns and hares ears are the best flies to use, although patience certainly is the main aim of the game at the moment whilst bank fishing. Wyndams Way pathway has been cleared to allow easier access to Sludge Point. This area is well worth a go if you have your waders with you as casting is tough without them. Not many fly predator anglers have visited this week, although the few who did caught some nice Zander to double figures. Look for the deeper water to land one of these beauties; they are in numbers and waiting to be caught. There are reports of large pike milling around, but these are playing hard to get at the moment. For those who enjoy a good breakfast before fishing you must try ours at the Harbour View before you start your day. This can be found above the fishing lodge at Mander car park. 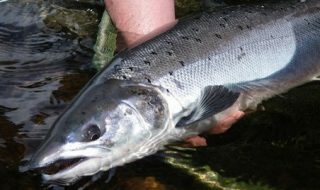 Please bear in mind, particularly during the hot weather, that fish may struggle to go back straight away when released. Please take your time when releasing to ensure fish are safely returned to the water alive. Grafham Water Fly Fishers (GWFFA) is hosting a free skills refresher afternoon on Saturday 27 August at the Grafham Water Fishing Lodge. In addition to GWFFA members the club would welcome interest from previous Anglian Water Beginners course attendees who would like to refresh their skills, and members of the public who are interested in taking up the sport. It’s a great opportunity for those new to the sport to learn the basics of how to cast. Improvers can enjoy coaching on casting style and technique. Mark Brinkman of GWFFA says “We will also have a selection of rod sizes, weights and line styles for you to try your hand with. Different casting styles are often needed to get the best out of the rods and lines. If you have your own tackle please bring it as we can complete a line/balance check for you. It is also good to try out new techniques on the equipment you normally use”. There may be an opportunity to go out with an experienced GWFFA member for an afternoon’s boat fishing skills coaching. This will be on a limited basis with a small charge of £5.00 as towards the cost. As GWFFA wishes to give personal tuition in small groups the numbers are limited. Please book your place by emailing chairman@gwffa-grafham.co.uk with you name, contact details and if possible give an idea of the skills coaching you would like. Best Rainbow 4lb 12oz taken by Tom Adamson. Best boat areas West bank, Sludge Point, Gaynes Cove, the Dam, Willows, B Buoy to G Buoy (drifting) and the Seat. Mid week boat winner Richard Anniss of Ingateson. Beginners courses 14 & 21 August; 4,18 & 28 September and other dates throughout the season. It’s proved to be a memorable week at Pitsford with the best Rainbow of the season falling to Phil Jordan. 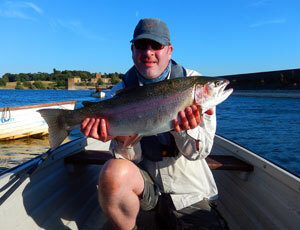 Phil has been fishing Pitsford regularly and was rewarded with a superb 11lb 8oz Rainbow on Sunday (pictured). This weekend was also the inaugural Pitsford Kayak Grand Slam which was a great success – see Competition News. Pitsford has been in fantastic form for August with a rod average of four. Phil Jordan’s 11lb 8oz Rainbow was a stunning specimen and the best of the season so far. Phil has been fishing Pitsford regularly and concentrates his efforts on picking out the better fish. He was rewarded on Sunday with a 30 minute battle and a fin perfect monster Rainbow which he returned to the water alive. The fish was tempted by a Hares Ear pattern fished on a floating line. Other notable catches this week included Mr Middleton and Mr Vincent-Piper who both enjoyed a great day bringing 21 fish to the boat on small orange blob and sawyer buzzers. Mark Draper had great success with his antique rod, bringing 30 fish to the net. The best of the fishing is to be had by boat from the main reservoir basin and by the dam. Anchored and drifting boats have both scored and the fish are mostly up in the top three feet or so. The bank fishing has been more difficult but fish can still be caught in the right conditions. It is best to set the alarm clock early and attempt to arrive at sun rise as this is the time when the fish are feeding in close and they can be tempted on dry flies. Try the Gravel Bank and Sailing Club bank. Best methods have been washing line or straight line; crunchers, hares ear and diawl bachs with some type of attractor such as orange blob or mini booby. In the right conditions fish are also being taken on dry flies such as crippled midge or hopper tied parachute style. The predator fishing has been a challenge this week and only a few smaller pike are coming to the lures. The best tactics are to keep mobile and work as many weed beds and features as possible. Perch have also been quite elusive with mainly small fish or under 1lb in weight being caught regularly. Saturday and Sunday saw the first Pitsford Kayak Grand Slam event which was a great success. Perch and Brown or Rainbow trout. The longest combined length of the three species won the slam. Good kayak fishing conditions on Saturday meant the anglers got to grips with most species, fishing mainly with spinning, jigging and drop shot tactics. Sunday brought some windy conditions which made paddling quite a challenge but most soldiered on to the end. Although no monster fish were caught eight anglers managed to achieve the slam with many others catching two species. This was a great result and we look forward to establishing this as an annual event at Pitsford. Dates for your diary include Pitsford’s popular Evening Summer fishing club which runs every Tuesday up to 9 August. Mid Northants Trout Fishers Association meets at Pitsford Lodge on the second Saturday of the month with fly tying, casting tuition and friendly advice on all fishing matters. Best Rainbow 11lb 8oz taken by Phil Jordan. Best bank The Gravels, Sailing Club bank, Cliffs. Mid week boat winner Mark Draper. Beginners courses 12 & 27 August; 3,16 & 21 September and other dates throughout the season.